Under Akhenaten's reign, traditional religious temples were closed. Akhenaten, an Egyptian pharaoh during the Eighteenth Dynasty of the New Kingdom, ruled between 1353 and 1336 B.C. His reign was characterized by vast changes to art and the movement of the capital city; these changes stemmed from his adoption of a new religion. Dubbed a “heretic king” by modern scholars, Akhenaten was immensely unpopular during his reign and ancient Egyptians reverted back to traditional worship practices following his death. Within several years of becoming king, Akhenaten began to focus upon one god, the sun disc Aten, with an extreme fervor uncharacteristic for ancient Egypt. 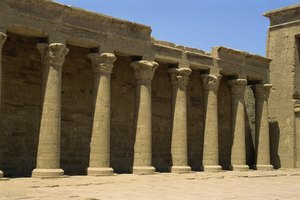 Since the early dynasties, Egyptians had worshiped numerous deities, with temples, art, and myths reflecting a vast pantheon of gods. Akhenaten’s religious focus upon the Aten was viewed as extreme, especially when the king abolished the traditional gods and closed their temples in the ninth year of his reign. 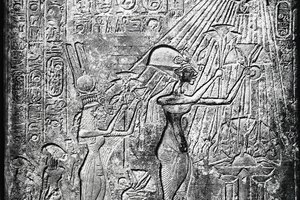 Akhenaten’s “Great Hymn to the Aten” poem describes his love of the sun god. Abolishing the polytheistic religion did not satiate Akhenaten’s devotion to the Aten. Rather than having the capital city in Memphis, where generations of kings had ruled before him, he deemed it necessary to relocate to virgin ground and chose the site of modern Amarna to construct his new capital city, which he named Akhetaten and dedicated to Aten. 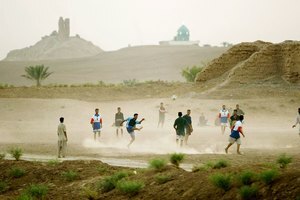 Akhetaten, located in the middle of the desert, was constructed quickly. 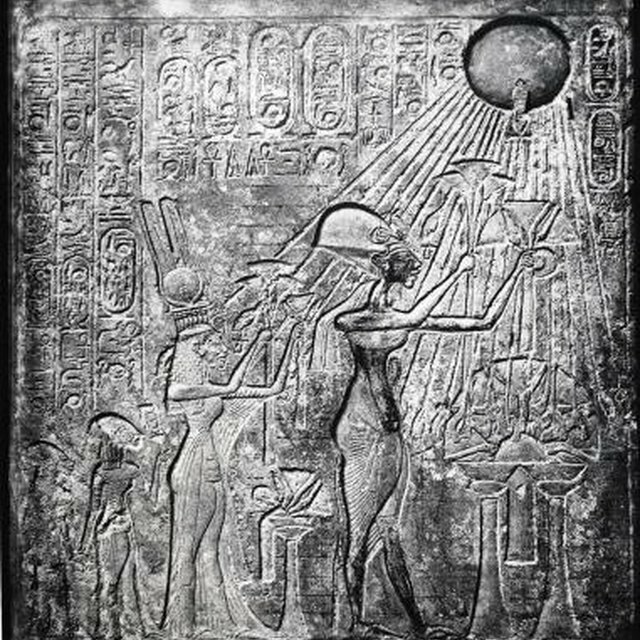 Many of the buildings had openings in the roofs so Akhenaten and the citizens of Akhetaten were able to look up and worship the sun disc throughout the day. 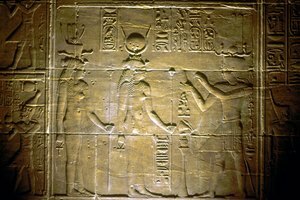 Akhenaten and his family make offerings to the sun god Aten. In addition to abolishing the traditional gods and moving the capital city, Akhenaten changed the art during his reign. Egyptian art had always been stylized, with a ritualistic canon of proportion used to depict humans. Thus even an elderly man was depicted as youthful. Akhenaten abolished the traditional artistic norms, and he and his family are shown in gross exaggeration, with elongated faces, thin arms, protruding stomachs and almond-shaped eyes. Many of the artistic wall carvings from buildings in Akhetaten show the royal family interacting with one another as well as the sun god, who is shown as a disc with long rays extending down towards them. Akhenaten died during his 17th year as king. Following his death, his nine-year-old son, Tutankhamun, became king. Working with viziers, Tutankhamun restored the traditional pantheon of Egyptian gods, moved the capital city back to Memphis, and returned artistic practices to pre-Amarna styles. Akhenaten’s radical religious beliefs had been too extreme for ancient Egypt, which relied on tradition, and he was omitted from lists of kings, and ultimately forgotten until modern times. Natalie Chardonnet began writing in 2006, specializing in art, history, museums and travel. In 2010, she presented a paper on those subjects at the National Conference of Undergraduate Research. Chardonnet has a Bachelor of Arts in art history and a minor in Italian studies from Truman State University, in addition to a certificate in French from Ifalpes University in Chambery, France. Chardonnet, Natalie. "The Religious Change Introduced Into Egyptian Society by the Pharaoh Akhenaten." 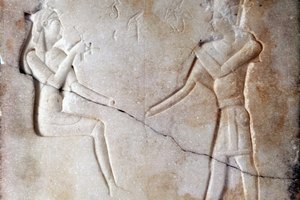 Synonym, https://classroom.synonym.com/the-religious-change-introduced-into-egyptian-society-by-the-pharaoh-akhenaten-12086286.html. 29 September 2017.